Before learning how to make great fries, I made a lot of bad batches. Soggy fries, burnt fries, and too salty fries. Finally, after reading a whole lot of recipes, watching a few videos and getting some tips from Heston Blumenthal on Australian Master Chef, I learned to make awesome crispy fries. This all made me think and come up with a theory. I think it rings true for all simple food. You can’t just read a recipe, copy it and then be good at making something. Sure you can make something decent or even good on your first try with a new recipe. But to really succeed, you have to give it time, learn and build on the recipes yourself. It’s like pasta or sushi. Good pasta making skills don’t come from reading a recipe or a book. It may start there, but what makes it truly great is in your head and hands. This recipe, like most other, combine what I have found from a whole bunch of other great recipes with the knowledge I have picked up over the years. 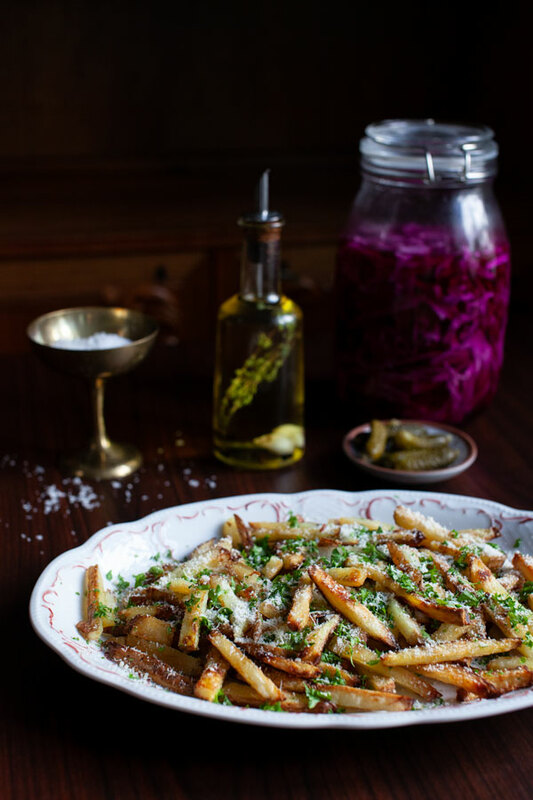 So if you truly want to make great fries, take a few key points from this recipe. Try a few others. Find what works for you and then make your own. French fry toppings are getting out of hand. In a good way though. Just do a search for fries on Instagram and take a look! Below is a list of our favorite things that go well with fries. 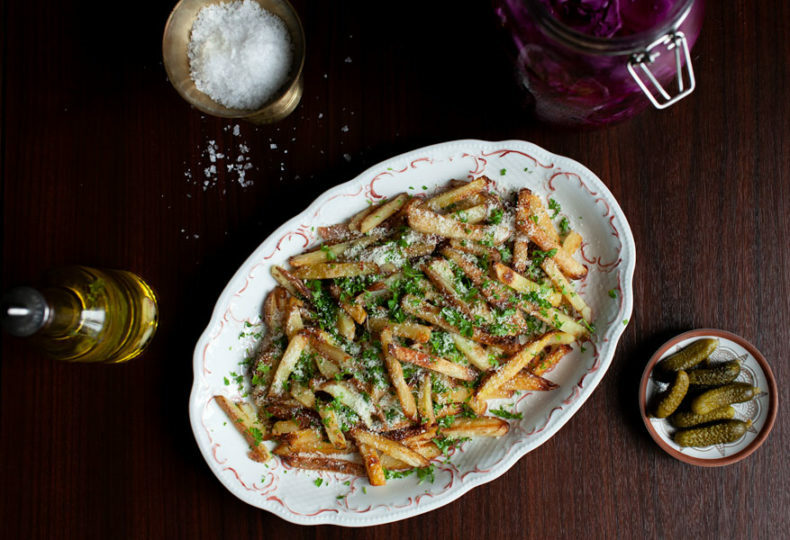 Parmesan – Who can resist parmesan fries? Or parmesan anything? 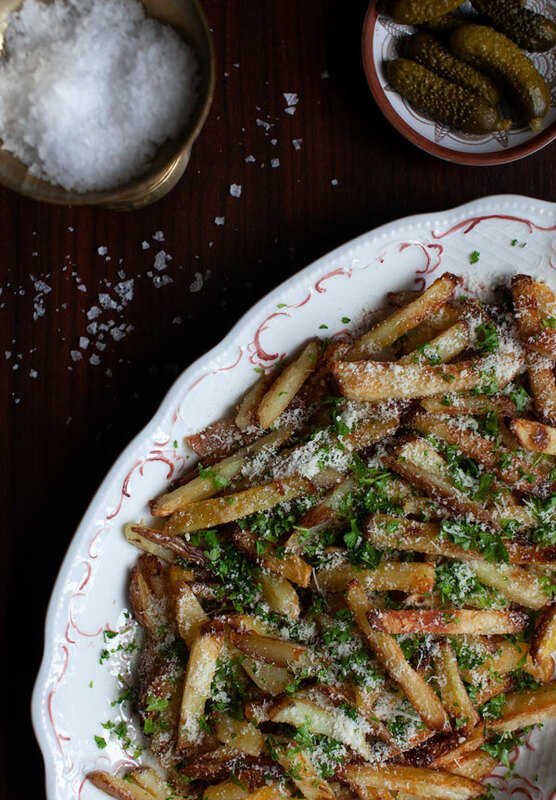 To change it up, try using Pecorino instead, it’s just as good if not better. Other types of cheese – Just before the fries are finished in the oven, drizzle over some cheese and pop them back in. Any type of cheese will do, go wild. Herbs – Dried or fresh. Anything pickled – You need something to cut through the salt and the fat. Pickled onions, cabbage or just plain old pickles. Flavored Oils – Garlic flavored oil can be used either when you cook the fries, or you can drizzle over after. Garlic Salt – Speaking of garlic. Step 2 Boil enough water in a big saucepan to cover the amount of potatoes you are cooking. Step 3 Cut potatoes into thin strips and transfer into the boiling water. Boil for 5-7 minutes. It doesn’t matter if the potatoes fall apart slightly as that will only make them more crispy. Step 4 Drain the potatoes in a colander and leave for a minute for the steam to evaporate and the potatoes to dry out a bit. Step 5 Transfer to a baking tray. Drizzle over a few spoonfuls of olive oil. Enough to just coat the potatoes. Sprinkle over a few pinches of salt. Step 6 Using a sharp knife, stir and move the fries around evenly. The reason we are using a knife is to make small cuts in the potatoes, which will make them more crispy. Step 7 Put in the oven for 20 minutes or until crisp and golden. Stir the fries and turn them every 5 minutes or so.